A 2001? This late? Must be a typo, right? No, not a typo. Here’s the deal with this wine. I loved this wine in barrel but shortly after bottling, it closed up tight as a drum. I freaked out. I was afraid if I released it as originally scheduled people would say, “Huh? What happened here? This isn’t what I’ve come to expect from Carlisle!” So, we decided to sit on it and if the wine came around, we’d release it. If not, well… Christmas gifts for family! Fortunately, it came around (sorry family!) 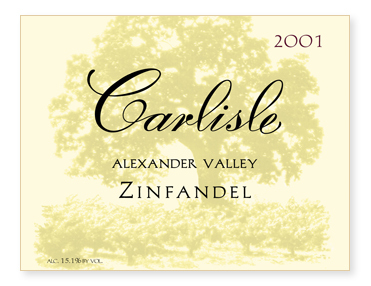 and turned into a beautiful, elegantly-styled Zinfandel that really shines at the dinner table. From vines planted in the late 1800s. Yields were barely 1.2 ton to the acre.